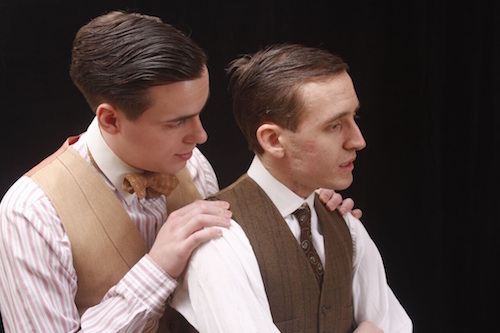 The Dialogues of Leopold and Loeb, a new play by Brad Walton playing at Alumnae Theatre, follows the personal relationship between prodigies turned murderers Nathan Leopold and Richard Loeb. While the subject matter garners interest, the script and performances were stiff and the duration of the play was unnecessarily long. The story has been told before, but Walton’s version aims to focus on the private relationship between the two boys. It picks up when Richard moves back to Chicago, following their personal, romantic and intellectual struggles as they begin pursuing crime. Starting with the harmless and escalating to ultimate bodily harm, it definitely is a fascinating historical subject. Unfortunately, The Dialogues of Leopold and Loeb took this electrifying story and rendered it rather dull. I thought the script was clunky off the top, with the first scene being a string of stilted questions and answers between Leopold and Loeb. Both the script and the direction were repetitive, and it was immediately obvious. This continued throughout, both in its greater themes and in its lines and wording. Walton’s script portrayed Leopold and Loeb as having essentially the same conversations over and over, and while the content was not uninteresting, the 5th or 6th time through I was losing my patience with it. Lines would often quote another from a minute ago. Staging fell into this trap as well, repeating the same physical movements, such as Loeb hugging Leopold’s shoulder, multiple times in almost every scene. This repetition is partly to blame for the show’s length, running at about two hours and forty minutes (which is certainly something worth mentioning in the program or website). The extraneous conversation was coupled with frustratingly long transitions where the audience was left watching a motionless, dark stage, the saving grace of which was the jazz music by Waylen Miki (impressively played in the dark by Miki himself). It’s my opinion that if the show had cut down to the necessary stuff and scrapped the repetitions, it could have been a one hour, one act. An unfortunate consequence of choosing to focus on Leopold and Loeb’s intimate moments was that all the most exciting scenes happen offstage, with descriptions of them afterwards. If the actors had brought more of the adrenaline back, it might not have felt like such a loss, but as it was I felt the most interesting parts of their story were being kept from me. The actors themselves seemed stilled by the script and the classic pitfall of trying to act “period appropriately” without really understanding what that means. I found this particularly true of Tom Beattie, playing Leopold, who was stuck in the demonstrative qualities of a gay man in the 1920s, with little inner life to back it up. I thought that Alex Clay, who played Richard Loeb, managed to have more subtleties to his performance. He portrayed Loeb as manipulative and boyish, and while he seems the instigator I still felt some empathy for him in that he seemed too young to quite understand all he pretended to. I also didn’t think that either of the actors mustered up enough passion or anger for any of their scenes holding a gun, or having one pointed at them, to be convincing. These scenes came off as more farcical that dangerous to me. Overall, I thought The Dialogues of Leopold and Loeb lacked subtlety, passion and honesty. I think the concept is good, but I also think that it needs serious editing and a different treatment on all fronts.